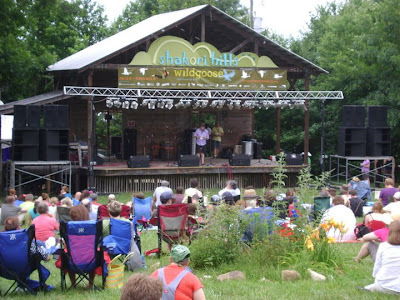 This past weekend, I attended the Wild Goose Festival, in Shakori Hills, NC, with something like 1700 other...I dunno...misfits for Jesus? Something like that. It was "a festival of justice, spirituality, music and the arts...rooted in the Christian tradition and therefore open to all regardless of belief, ethnicity, gender, sexuality, denomination or religious affiliation." It was amazing. For four days, we camped, walked, talked, listened, sat, ate, drank, hugged, laughed, prayed, sang, danced, and wept together. The Wild Goose is a Celtic metaphor for the Holy Spirit. She blows where she will, and (like Aslan in the Narnia books), she is not safe. I have felt her gentle breeze before, as it gently grabbed me by the ankle, turned me upside down, and banged my head repeatedly into the ground, after repeated attempts to whisper vital information into my ear and heart had proved noneffective. I can't speak for any of my fellow Goose people, though I suspect I'm not alone. I don't really know if I went to this gathering - a gathering named for God's dynamic Spirit - expecting to come home unchanged. All I know is, that's not what happened. I'll be a while sorting out all the ways this past weekend has affected me. I'll probably follow up this post with some more reflective posts on that topic. For right now, I'm actually using my blog (which I haven't used much, lately) for a very practical purpose. The one thing that I feel clearly seared into my heart following my experiences at the Goose - the one thing that is prompting me to begin a process of formation leading (relatively quickly, I hope) to action - is a much-belated conviction that I have been a piss-poor ally (really, not worthy of that title at all) to my Lesbian, Gay, Bisexual, and Transgender sisters and brothers, despite the fact that I am a card carrying member of the institution that is doing more than any other to cause pain, suffering, and injustice for folks in those communities - that is, the Church. In light of my experience, I am beginning an intentional process of opening myself to formation as an ally - one who actually uses his voice, risks and spends his privilege, and potentially helps make a difference in the world (and more specifically in the Church) in solidarity with my LGBTQ brothers and sisters. As I begin that process, I think I'll use this blog to record resources and stepping stones I find along the path that seem helpful. I'm doing this for my own accountability, and also as a potential resource for others who might be feeling this particular call from the Wild Goose of God's Spirit. And also (unofficially) my amazing friend Rachel! Well, you have wasted no time in adding action to your intent in regards to being an ally. I am so glad that Wild Goose and the people you experienced provoked you to love and good works. Thanks, Peterson! I have to admit, one reason I'm wasting no time is that I feel like, by publicly committing myself to this, I'm making it harder for me to just settle back into my regular, complacent way of life and church and let the fire ignited by y'all this past weekend just kind of burn down. 'Cause I know very well how easy that would be. In the past, I've even been known to make public declarations (like this) of intent to follow what seems to be a missional call - and then to not really get around to doing anything about it. Granted, the two main times that happened, there were extenuating circumstances (once it was a crisis of faith following a tragedy, and another time it was a year of mania and depression when my bipolar disorder flared up). But extenuating circumstances are everywhere - all the more reason to put myself in a place where there would be a price to pay re: my own integrity if I just wimped out. Hearing Jay Bakker speak to this issue was like a mighty slap up against my head. I confess that I had not appreciated the urgency of it. I too am ready to get serious about this. Welcome to synchroblogging, and you did well -- at least you included the list of links, which many others didn't. One of the nice things about synchroblogs is being able to surf from one contribution to another and see such a wide variety of viewpoints on a common topic, and leaving off the list of links breaks the chain. I wasn't at the Wild Goose thingy, so I'm relying on other's (like you) to tell me what it was all about. My contribution is more about media reports about media reports about the festival. interesting post!we love visiting in your blog...we will come back soon.